Halloween is one of the most spectacular nights for all kids, big and small. What other holiday encourages you run around your neighbourhood dressed in crazy costumes and go begging for sweets! For some (like my sugar-junkie child), this is the highlight of the year. And it looks like Sandy won’t totally washout the evening….more of a gentle rain. We normally divide our time handing out candy and escorting our child house to house. Invariably, he comes back with a mixed bag…some great stuff, some meh, and some just gawdawful. For a few years, we didn’t know what to do with the reject candy and it just lay in our cupboard collecting dust. What a sad, sugary waste. Enter the solution, the scourge of Halloween. That would be the big kids, often taller than me (which is not saying much) that still go trick or treating but don’t bother with a costume. It’s laziness with a side order of menace. 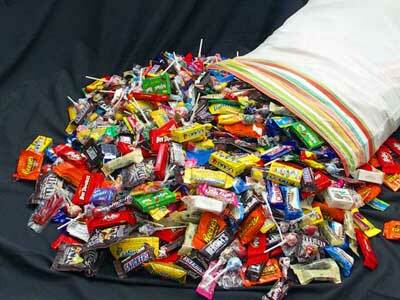 Most of us still dole out our precious candy to keep them happy and our house facades egg and toilet-paper-free. Here’s where we finally learned to be creative. We now go through our son’s bag of candy not only to inspect it (and lets be honest, eat some), but to create the Reject Pile of Ick . We save this pile to dish out to the costumeless teens. How’s that for recycling and reusing? And the timing couldn’t be more perfect since they tend to go out after we’ve already returned. In the end, everyone’s happy. They get candy, we don’t collect waste, AND we don’t get egged (at least, not yet). Such a good idea, it’s worth copying/recycling. P.S. for extra safety while going trick or treating, attach your bike light to your child’s costume. It makes them more visible and their costumes even more spectacular…definitely worthy of the good candy 🙂. This entry was posted in Beyond Talkin' Trash and tagged 3R, halloween, recycling. Bookmark the permalink.